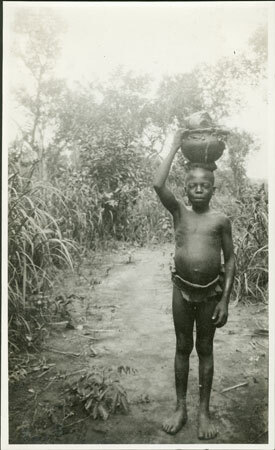 A boy (identified as Kunga) carrying an earthenware pot on his head containing food, on his way to a chief's home along a path through the bush. Notes on print/mount - "Kunga 51/3 +10 EPA741"
Notes on card mount m/s pencil - "SS upper & LHS + fading"
Morton, Chris. "Zande boy bringing food for a chief" Southern Sudan Project (in development). 03 Jan. 2006. Pitt Rivers Museum. <http://southernsudan.prm.ox.ac.uk/details/1998.341.741.2/>.